KIM Jee-woon’s highly anticipated Inrang (Korean title), a remake of the acclaimed Japanese animation Jinroh: The Wolf Brigade, is almost upon us. Along with a pair of teaser posters, local distributor Warner Bros. Korea announced that the film would be hitting screens at some point in July. Set in the year 2029, the story of Inrang takes place as North and South Korea has been preparing for a reunification for five years. Various factions oppose the union and a dangerous terrorist group known as ‘Sect’ arises. In response, the government sets up a special police force. The original Jinroh was released in 1999, directed by OKIURA Hiroyuki and written by the famed OSHII Mamoru, who is known for directing Ghost in the Shell, among many others. GANG Dong-won (Master, 2016) plays IM Joong-kyung, a member of the special force, while HAN Hyo-joo (Cold Eyes, 2013) plays LEE Yoon-hee, the elder sister of a girl who detonates a suicide bomb in front of IM’s eyes. 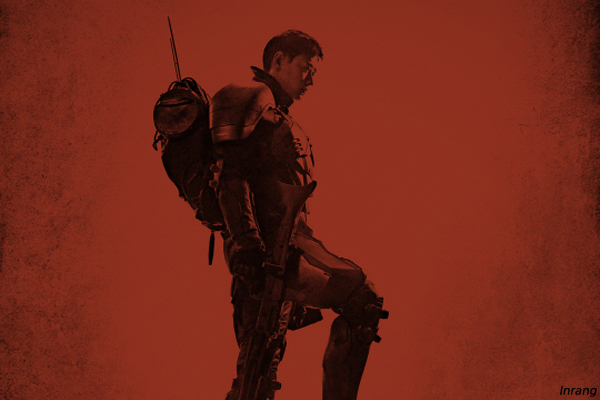 JUNG Woo-sung (Steel Rain, 2017) features as JANG Jin-tae, the head of the training academy for the special force. Co-stars include GIM Mu-yeol (Forgotten, 2017), HAN Ye-ri (Worst Woman, 2016), HU Joon-ho (The Merciless, 2017) and Min-ho (Derailed, 2016), a member of the Kpop group SHINee. Given the blockbuster size of the production, it’s a safe bet to assume that Inrang will drop in the second half of July, a prime movie-going season in Korea that has served as the launching pad of several big-budget Korean films, such as BONG Joon-ho’s Snowpiercer (2013), YEON Sang-ho’s TRAIN TO BUSAN (2016) and RYOO Seung-wan’s The Battleship Island (2017). It will likely face strong competition with Mission: Impossible - Fallout also expected in late July (though no date has been set yet), while KIM Yong-hwa’s Along with Gods: The Last 49 Days and YOON Jong-bin’s The Spy Gone North will likely follow in early August, along with other local titles rumored to be eyeing late summer releases, such as WOO Min-ho’s The Drug King.